As digital technology continues to rise, graphic arts have learned to adapt and create new techniques. While new artistic frontiers are expanding, at Lee T-Shirts, we like to accompany for everything. This includes traditional printing methods and techniques such as screen printing. 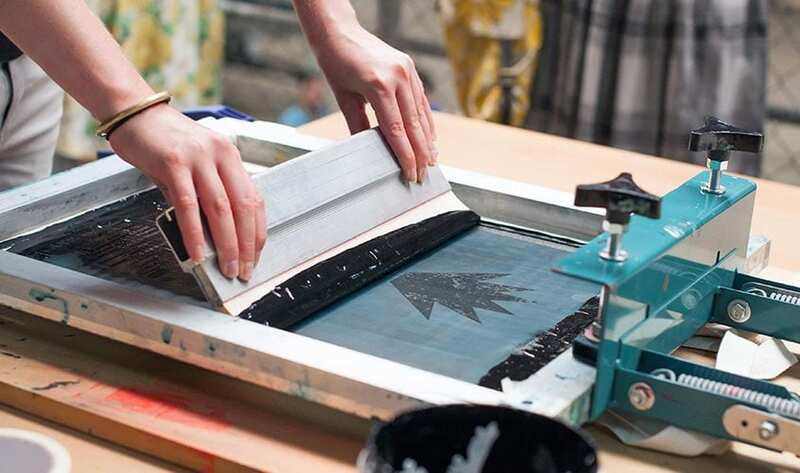 Screen printing is the process of creating a stencil (otherwise known as the ‘screen’) and using that stencil to apply layers of ink, one colour at a time, onto the printing surface. As a hand printing method, this technique allows for more unique products. This includes water bottles, mugs, bags, etc. As the printer can manually handle uneven or curved surfaces for a smooth application. The ink used in screen printing has proven to absorb deeper, providing greater defined edges to the image, and resulting in longer-lasting, more vibrant colours even on darker shades of material. As a more cost-effective solution when compared to digital printing, screen printing allows for faster turnaround times when creating large quantities of a particular design. This method also allows for more accurate results. The areas where the stencil is open allows ink to slip through and press onto the desired fabric or material. At Lee T-Shirts, we have the ability to produce large or small orders without compromising on the quality of our work, your design or the material on which we will print. Whether you’re looking for something personal or you’re a business wanting to stand out from the crowd or advertise through products, we have unique and tailored Brisbane screen printing solutions for you. As one of the most versatile printing methods available today, screen printing does not hinder your material choice, with the ability to print on anything from vinyl and glass through to metal and plastic. For custom screen printing results in Brisbane, Lee T-Shirts can help turn your design idea into a reality with your desired colours, stencils, materials and fabrics. We strive to provide reliable and durable screen printing solution for your custom garments. If you want printing with excellent results, turn to us at Lee T-shirts. Lee T-Shirts is proud to manufacture and supply high quality custom t shirts Australia wide to help you stand out from the crowd. Our fully customisable apparel is professionally screen printed, embroidered and designed in-house at our local manufacturing centre. We use state-of-the-art printing technologies and superior textile decoration solutions. From promotional and corporate branding to personal gifts and Design Your Own prints, we can turn all your designs into quality decorated garments delivered directly to your door. With a professional, personalised service and competitive pricing for both single and bulk orders. Our custom t shirts Australia wide are finely crafted with care and precision to ensure a premium, commercial quality product each and every time. Alternatively, to discuss any information about our products and services we welcome customers to visit our showroom at Unit 4/129 Robinson Road East, Geebung, Brisbane. As Brisbane’s screen printing specialists, we’ve seen it all. From a single personal use right through to corporate uniforms and even a few runs of mixed merchandise. All of this, and more, is what makes us the experts in our field. With the most advanced pieces of equipment and the highest-quality inks from the best brands. We can produce fast results without compromising on the quality of your desired product. With a strong focus on customer satisfaction, we work with you on a transparent basis to produce the results you want. We ensure you love your purchase and will wear or use it proudly. When it comes to screen printing for corporate use, we understand the needs to keep your brand consistent. It’s the one thing that ensures you’re making a strong statement of who you are as a company. At Lee T-Shirts, we aim to help you be proud to rep that uniform. On the other hand, you might just be looking to make a smaller, more personal order. Whether you have an event such as a hen’s night, a birthday party, we have you covered. No matter the special occasion, we can produce some commemorative merchandise to fit your requirements. Better yet, we can get it done quickly, efficiently and at a low cost! Whether you need to look the part, or you’re getting creative with your own designs. You can find what you’re looking for with Lee T-shirts. We're are an Australian based, family run business with a strong focus on producing quality clothes. We deliver outstanding service every time. We make sure that your interaction with us at Lee T-shirts is an enjoyable one. Specialising in garment decoration and enjoy providing quality screen printing. We specialise in all kinds of garment decoration. Including screen printing, embroidery and digital transfers. No matter the design requirements, we can help. All of our printing and garment management is done on-site, so you’re not going to be left waiting. Looking for a versatile, long-lasting and cost-effective solution to getting a piece of material screen printed? At Lee T-Shirts, we have the staff, knowledge and equipment to produce high-quality products produced to your individual requirements! Whether you’re making a commercial, retail or personal purchase, we ensure the best outcomes each and every time. We are proud to be Brisbane’s leading screen printing specialists, carrying out both large and small requests. For superior quality screen printing in Brisbane, get in touch with Lee T-Shirts today for a free quote!